If you’ve seen Bernie, you’ll know what to expect from Jack Black’s newest larger-than-life true story, The Polka King, a tale of a little man with his sights set on big crime. Black was made for this role, a silly musician with a dark secret, and it works just as well as when he played Bernie, the killer that everyone loved. That movie was a surprise hit, but Black is actually a strong actor, he just has such a unique sense of humor that it’s hard to take him seriously. But in this film, his character is a perfect combination of both the ludicrous and the lamentable with a good deal of singing thrown in, wonderfully fitting his exact talents and resulting in the best movie of the month-old year. Jan Lewan, the Pennsylvania Polka king, the entertainer with a thousand huge ideas, all of them magical, none of them good. He moved to the U.S. to perform his music, but also to follow the American dream, to become something much grander than should ever be truly possible. Polka parties, festivals, telethons, local events; octogenarians far and near flock to see the great Lewan. But it’s not just music, Jan branches out in many other areas; vodka, amber jewelry, Polish knickknacks, you name it he sells it. And his newest scheme is his best (and most illegal) yet. For a few thousand bucks you can turn your retirement money over to Jan, investing in his fame, with guaranteed* returns on their way as soon as he hits the big time. Trouble is, that’s against the law, Jan is no businessman, and people will eventually catch on to this dimwitted Ponzi scheme. 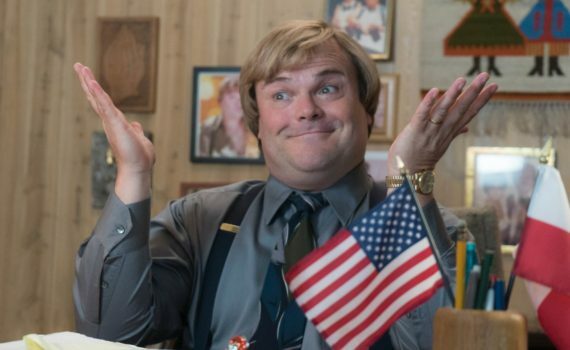 Jack Black is in his element and The Polka King works because of it, easing along without a hiccup to become a Netflix Original success, if not exactly blowing any minds along the way. Polka music is ultra-catchy, and Black sends it deep into our brains until we begin to convince ourselves that Jan Lewan was actually talented. And then the crimes come along, but you kinda love the guy anyway, even though he’s a con man. Black is just that awesome, and he really captures the essence, the absurdity, the wackiness of this real life story. Someone should give an award to Jason Schwartzman though, who is hilarious as Jan’s BFF and band leader, with Jenny Slate and Jacki Weaver rounding out a solid cast. Of course this movie worked, it’s worked before and it’ll work again, as long as Black keeps selecting these fascinating, funny, non-fictitious characters and Netflix keeps up the good work.